Wide assortment of 18k white, yellow and rose gold earrings, with unique manufacturing, adorned with precious stones. Ironic and multi-faceted collections for children decorated with precious stones, colored enamels and natural pearls. EAR​RINGS There are 2 products. 18 kt 750/1000 yellow gold earrings with white stones and zircons, ideal for women who want to wear a classic and intramontable jewel. 18k 750/1000 gold multi-tone woman earrings. Choose the charm of the link between yellow gold and white gold or the union of the three golds, white, yellow and pink. For the self-confident woman who loves being always original. 18k 750/1000 gold woman earrings with natural pearls. 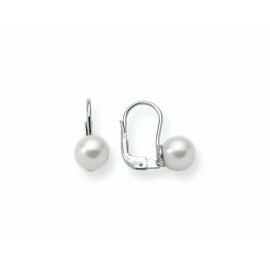 You will find salt water or freshwater pearls, let yourself be inspired by our unique collections. 18k 750/1000 gold for baby girls earrings, symbols of fortune or imaginative, to give as a wish for happiness.